Registration for Winter/Spring 2019 is open now! Welcome to my Homeschool page! When a new-to-homeschool mom told me her son needed to practice his social skills in a positive, school-like environment, I created a Harry Potter homeschool curriculum based on my Harry Potter Enrichment After-School Class. Her son had taken that class when he was in a traditional school: "It was the highlight of his year," she said. I've been an avid fan of the books since they came out and have been teaching Harry Potter after-school classes and camps since 2010. That first class -- five hours/week for 13 weeks -- was based on The Sorcerer's Stone. We covered the second book - The Chamber of Secrets -- for the twenty week winter/spring term. These classes give students a chance to make their favorite books come alive using hands-on learning. My home studio, called the FAD PAD, is an ideal place for children to learn and create while having fun! Here are some endearing photos of some Harry Potter connoisseurs! Making books come alive with creative hands-on learning activities in a homey, fun and supportive environment. This class will be based on, "Harry Potter and The Chamber of Secrets." 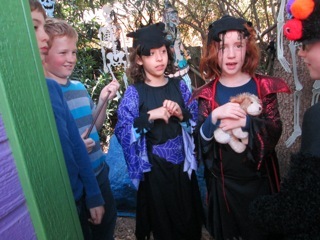 We will delve into the magical and imaginary realm of witches and wizards through art, play and drama. Some of the various activities will include Diagon Alley, making wands, choosing the perfect witch/wizard outfit, creating an original name & house name, the Sorting Hat, Mandrakes, the Death Day Party, Valentine's party, visiting Aragog in the Forbidden Forest and the Chamber of Secrest Quest as well as attending Charms and Potions classes. On February 12, we will be having a special magical Valentine's Day party in honor of Gilderoy Lockhart! We also like to celebrate the seasons at Starwitz such as Spring Equinox. This class is for children 6-12 years old. (older or younger if you think it would be a good fit) 8 students maximum enrollment, 4 students minimum. Oakland location near 580 and Edwards Ave.
Headmistress, Mary Ellen Hill, MA, has been an avid fan since the HP books came out! She has been a professional storyteller since 1990. She is the director of FAD PAD playshops and camps. Mary Ellen also brings 35 years experience as a special and elementary education teacher and an after school day care teacher at Adventure Time. She has been teaching Harry Potter classes and camps since 2010. She has been offering Homeschool classes since 2014. Each student will make wizard money- galleons, sickles, and knuts from beautiful gold, silver and bronze paper. They will create a cloth pouch to hold their wizard money. As a class we will set up Gringotts and choose the parts of goblins and the wizards/witches coming to the bank. Then we will act out the scene. Scholarships and Payment Plans available. 1. 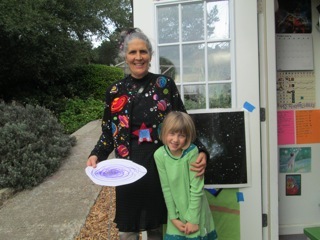 Make a check out to and mail it to: Mary Ellen Hill, 7548 Circle Hill Drive, Oakland, CA 94605. 2. Use your own Pay Pal account and pay under the family and friends button to mehstories@netzero.com. 3. Use VENMO on your phone to Mary Ellen Hill, 510-219-3474. Do you have a child or a group of children that want to be together in a fun, creative, homey setting? 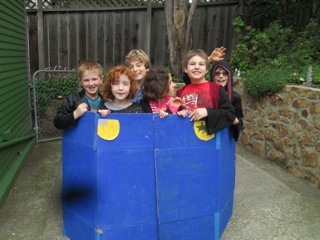 I am delighted to create any particular homeschool class they would enjoy! 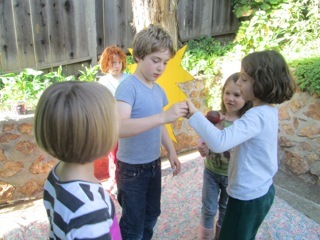 I tailor make a 2, 3 or 4 hour class for one child up to eight. 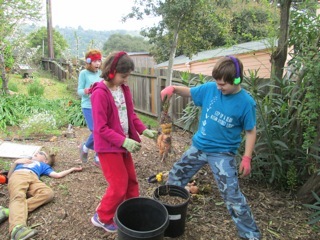 Classes offerings: Science (see below), Gardening, Cooking, Hand Sewing and Embroidery, Fairy Lore, Drama and Storytelling, Drawing and Painting, Cooperative Games and Free Play. This is the 2 hour class that I taught in the winter of 2014. This came from a mom's request for a hands- on science class for her son. I have been studying and exploring cosmology, evolutionary biology and eco-justice since 1987. My specialty piece as a professional storyteller is called," We Are The Stars That Sing: The Story of the Universe". I presented workshops and created supportive materials that enhance this particular piece. With all of this under by belt, I felt ready to create this new class. 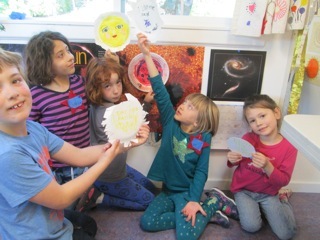 This dynamic 12 week class will explore the 13.7 billion year old story of the Universe, Stars, Earth and All Life through storytelling, various art forms, drama, and science experiments. We will cover the Flaring Forth (the Big Bang Fireball), the birth of quarks, atoms, stars, Milky Way, Solar System, Earth, Moon, plants, animals, and ourselves! On the last class we will all make a birthday cake and have a big celebration! This class is for hands- on learners, those that like delving into all types of art and also for science lovers! One Example: We will use storytelling, sound, movement and role play to enact matter, space, time and energy flaring out of the big bang as well as the creation of quarks. Here are some photos from that fun class!